PLEASE READ: The Genesis does not require a modification for RGB-output, simply a cable. This page is an “experts-only” page that shows how to bypass the Genesis’ internal RGB amp with a different one. All details are below, but this mod requires you to make irreversible modifications to your Genesis system. Beginner and intermediate modders should not try this mod! This page demonstrates using an RGB Bypass board that can be installed into any Genesis console, as well as a Sega Master System. At this time, it is not recommended that a bypass is done in Genesis / Mega Drive model 1 consoles. This is due to a second source of interference that had not yet had a fix identified. As a result, doing a fully bypass removes the analog noise such as jailbars, but ends up amplifying the RAM noise interference, causing it to look worse. Simply lifting the subcarrier pin (disabling composite video) will remove most interference from the output and will be a large improvement over stock video output. All Genesis 2 and later consoles will absolutely benefit from a full audio and video bypass. The Triple Bypass board is the recommended solution for this. Jailbar fix: As shown in the picture above, performing this bypass on most models will completely remove analog video jailbars from the Genesis’ output image (other than early model 1’s). Simply lifting the subcarrier pin on the VDP (thereby disabling composite video) will result in an excellent analog video signal improvement on all model Genesis revisions, however a true isolated bypass is the only way to get the best possible signal on the boards that are compatible. New RGB Amp: All Genesis and SMS systems use a Sony CXA1145 chip to amplify the RGB signal. The CXA1145 is an excellent chip, however the bypasses uses the newer Texas Instruments THS7374, which has a high-quality, switchable low-pass filter that removes unwanted noise. Using the THS7374 isn’t a clear “better or worse” choice, it’s mainly a preference. Some might argue that the “ringing” the CXA1145 produces creates the specific look of the Genesis that we’re all used to and shouldn’t be changed. I’ll leave that up to you. What exactly is required for this bypass? Find a mounting location for the bypass board: You’ll want the board as close to the raw analog signal as possible, but make sure none of the wires are run near the oscillator. Isolate RGB (not sync) directly from the video chip: This bypass starts by getting RGB from the video chip, before it’s amplified and sent to the multi-out. This can be done on every model of the Genesis, however you’ll have look up the RGBs pins on the specific chip for your console. I suggest checking console5.com, as well as Googling. Also, I suggest soldering to the VDP’s sync pin, but not lifting it, as some model Genesis consoles require the pin for the Z80 to run. If you’re using a Genesis 2, 3 or CDX, or simply prefer to use the existing Genesis 1 / SMS multi-out, you’ll need to sever the connections between the multi-out and the existing RGBs signal. This is most likely irreversible and should be done with caution. I always recommend that all mods done to any console result in the exact same output signal as the original console. This makes purchasing cables easier, as well as prevents future users from not knowing it’s modded and using the wrong cable. Essentially, for this mod, you’ll be connecting RGBs directly from the amp to the multi-out and utilizing the resistors and capacitors in the cable, just like a stock console. If you’re using a custom output connector with a passthrough cable, you’ll need to add the proper components to this circuit. 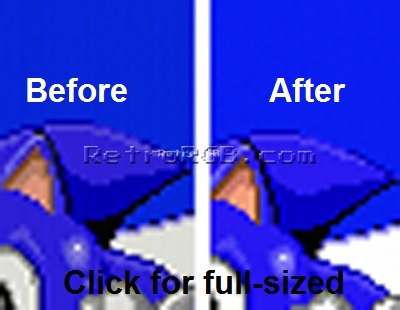 As an FYI, if your image is too bright or too dark after performing this mod, you probably made a mistake in this section. This guide is filled with ominous warnings about all the potential negative things that this bypass can do. I added those to make sure I wasn’t misleading anyone into thinking this is a “necessary” mod, like adding the RGB amp in an N64. While this mod may fix issues for many people, it’s really just a preference…one that I absolutely love and prefer to use on my systems. It’s totally up to you if you’d like to try it as well, but I’m extremely happy I did.